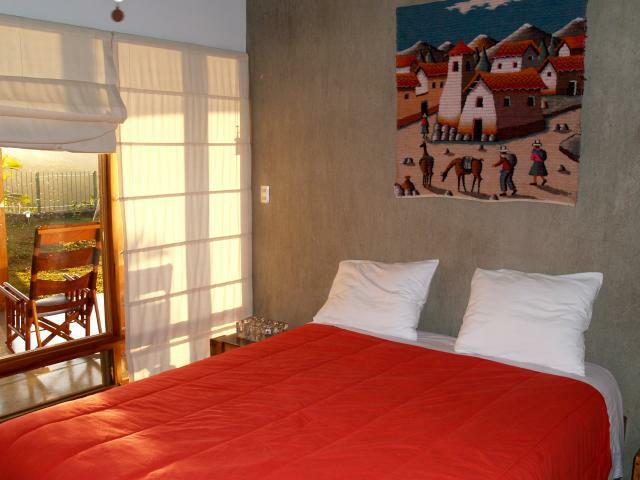 When you visit San Ramon, we recommend you stay at Casa Amanecer Bed & Breakfast. Your innkeepers, Chris and Luisa Panzer, are great people, very warm and welcoming. 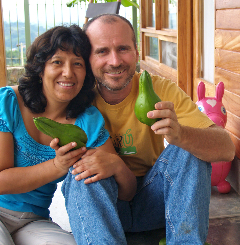 Chris is originally from Maryland and his wife Luisa is from Peru. They met each other at Habitat for Humanity here in San Ramon de Alajuela and eventually returned here to build their B&B. They serve great food — all organic, vegetarian meals — and offer many unique services. 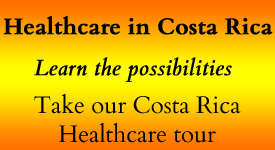 For more information, be sure to read Chris’s article below the contact form. 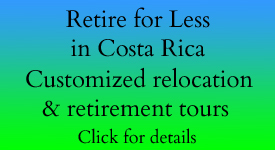 Always ask for the 10% “retireforlessincostarica.com” discount when contacting them for reservations. To receive more information including rates and availability, contact Chris & Luisa by completing and submitting the form below. Comments or questions are welcome. When would you like to stay at Casa Amanacer? 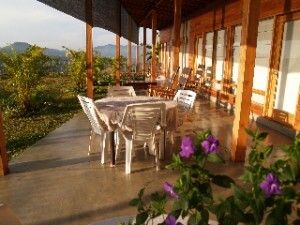 Casa Amanecer is a quaint little Bed and Breakfast nestled in the hills just outside San Ramón. We built the house (featured in the March 2009 issue of Costa Rica architecture magazine Su Casa) with simplicity and efficiency in mind. Large, east-facing windows allow the morning sun to flood the entire house, warming it and gently persuading us and our visitors to rise and begin our day. The unassuming, natural colors of the teak, concrete and stone walls create a warm backdrop to the colorful life we have created here over the past several years. 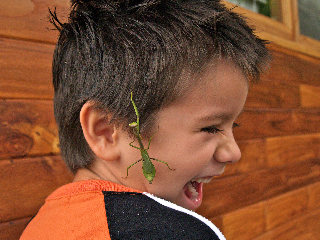 Since the time we moved here permanently in 2001, we had slowly put down roots, making friends, creating community, and feeling right at home in this medium-sized Costa Rican town. When our employer at the time, Habitat for Humanity Costa Rica, pulled up stakes and moved their national headquarters from San Ramón to San José, we knew we would not be leaving our beloved town. Even after taking a year to think about it, visiting our respective home countries of the United States and Perú, we were only convinced even more to stay. As a matter of fact, we felt there was nowhere else in the world we would rather live and raise our children. It was a tough decision to have to part ways with Habitat, an organization that was dear to our hearts, but we knew it was time for a change in our lives, serving people in a slightly different fashion. Now, for some, opening a tourist-based business in a decidedly non-touristy area such as San Ramón might not sound sensible. I mean, look at the guide books and the travel magazine advertisements that boast Costa Rican wildlife, beaches and volcanoes. Why not set up shop in a well-marketed tourist hot spot instead? We thought about that, of course, and soon realized we wanted to offer something unique—something that doesn’t appear in thick, pocket-size books or glossy magazine pages. 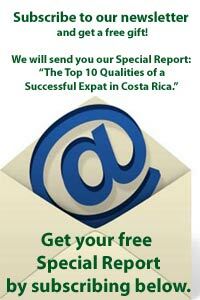 What we wanted to offer was a genuine Costa Rican experience. We imagined that Casa Amanecer, which means House of the Rising Sun, aside from being an inviting place with comfortable beds that would welcome guests from far-away places—some their first night in this wonderful country—would also become a sort of low-key clearing house of Latin American culture. It would be a place of books, music, food, dance lessons, impromptu Spanish classes and crazy, hand-drawn maps to point visitors to interesting, out-of-the-way places in the area. 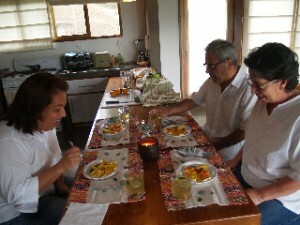 We would attend our guests ourselves, cook for them, sit with them over coffee and talk about their travel plans, often suggesting local activities such as cloud forest hikes, dance lessons, horseback rides to waterfalls, antique sugar cane mills, coffee tours, local zip lines and even Quetzal spotting. 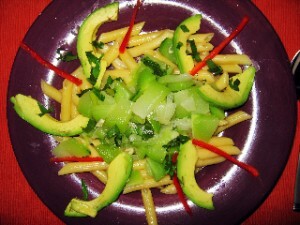 We also imagined our B&B would also offer a taste of healthy living. Meatless meals with many raw-food options would be offered. Professional massages and morning yoga would also be offered to bring balance and a sense of well-being to our visitors. So, here we are, going onto three years now running our B&B and we’re loving it. We appreciate this opportunity to be able to live and work in our own home with our children right here with us. We serve up local coffee and fresh, healthy breakfasts made mainly from organic ingredients that we purchase from the farmer’s market in town. It gives us a great sense of satisfaction to work hard and give our visitors the best that we have to offer: a warm, welcoming, peaceful place to land, as well as healthful meals and a glimpse into our own health-conscious lifestyle. 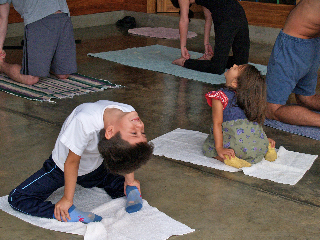 We are also grateful to be able to give our guests the opportunity to experience, firsthand, how Costa Ricans live and work, and how the truly happy ones tend to have less possessions and more time for family and friends. I think this is an important lesson, especially these days, when more and more people are forced into this very situation. Seeing how our neighbors have happily lived this way for generations can be an eye-opener for many foreigners. I’m sure that many of them have returned home with a new sense of appreciation for what they have and possibly a desire to create more time for their own family and friends. Many people, those passing through on their way in, or on their way out of the country, comment that they wish they had planned to spend more time here. Our guests appreciate the genuine Costa Rican experience that we offer, as well as the genuine personal attention that we give them. 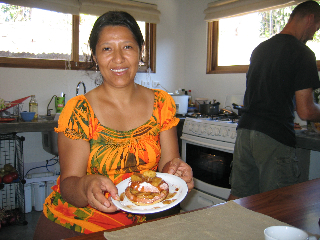 We truly do love making other people feel at home in our place and in our lovely little town of San Ramón.